I had a wonderful time while on my trip to Sicily. My guide Francesca was friendly, knowledgeable and so helpful and supportive during my entire time with her. I recommend any one planning a trip to Sicily use this wonderful organization. 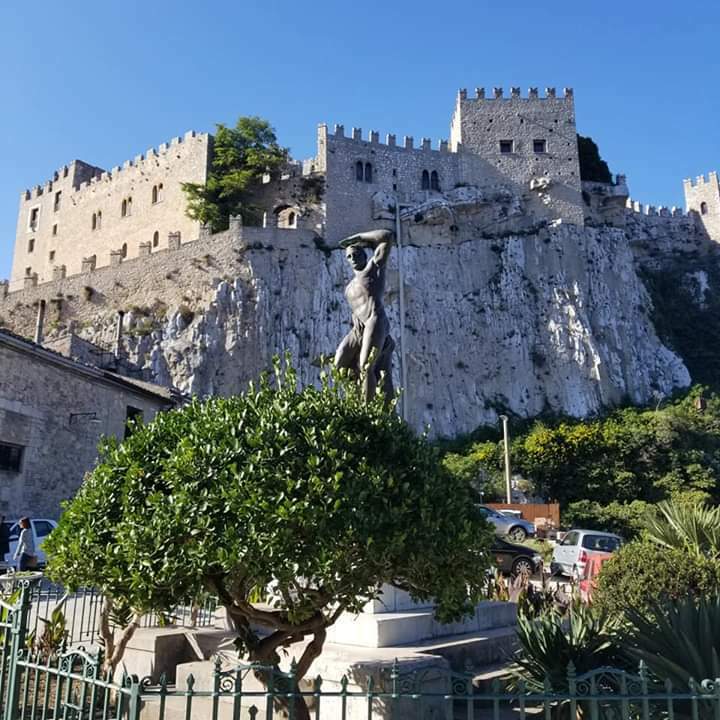 I was fortunate to find Ciro and Sicily Routes via a recommendation on a Sicilian genealogy page on Facebook. 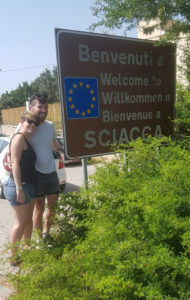 When I found out Ciro knew the area where my grandparents emigrated from (Caccamo and Ventimiglia di Sicilia), I really wanted him to be our guide for the heritage portion of our trip to Sicily. His lovely assistant Cristina was our guide for the day, and we got to visit my grandparents’ hometowns, including a tour of Castello di Caccamo. We also enjoyed the festival of the Madonna of the Rosary in Ventimiglia di Sicilia. 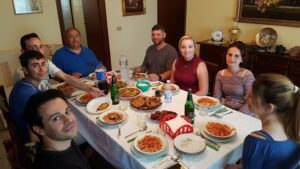 As a special treat, we got to meet the mayor and had dinner with the locals, including Crisitina’s family who were very welcoming. I felt very welcome and I can’t wait to return! Ciro and I collaborated for over a year to create a customized immersive group tour of Sicily. In that time we became partners and friends and when it came to “delivering”, everything was absolutely as promised (and more!) 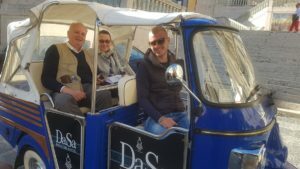 Throughout our tour (October 2018), Ciro and his local guides/contacts were outstanding professionals contributing to the success of the tour. As a trusted preferred travel partner in Sicily, I wouldn’t hesitate to refer clients to Ciro and Sicily Routes! 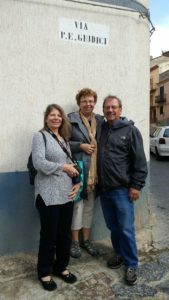 Thank you for being a fantastic guide and showing us a great time on our recent visit to Sicily. Special thanks for help with closing the language barrier with me and my cousin on a special visit in Sciacca. Also, what a special treat with the visit to the Weigner Vineyard. Your suggestion and arrangements here far exceeded any expectations. 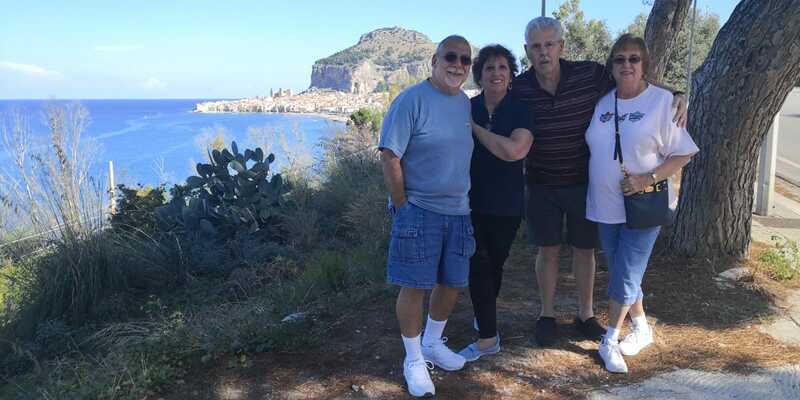 My children and I visited Sicily in September and Ciro Grillo was our tour guide and Rosario our driver. I can say that we had the most wonderful experience due to the professionalism and knowledge of our guide. The hotels were unbelievable and the suggestions for touring and dining were outstanding. I cannot say enough wonderful things about Ciro. If you want to see Sicily he is definitely the go to guy!! Excellent!! I wanted to tell you what a wonderful experience we had with you and your team. The bed and breakfast Villa Cannoli you recommended exceeded our expectations we felt very much at home and loved breakfast on the terrace every morning.. We were a little hesitant at first but Pietro and Salvatore were wonderful. 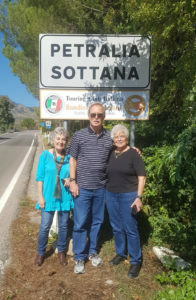 Our day with Rosario and Andrea was great we enjoyed Erice and your suggestion to go to Segesta was great Frank loved the ruins our trip to Trapani and the salt ponds was interesting. The weather was a little cold but Rosario had jackets in his car that we used. He really came prepared. 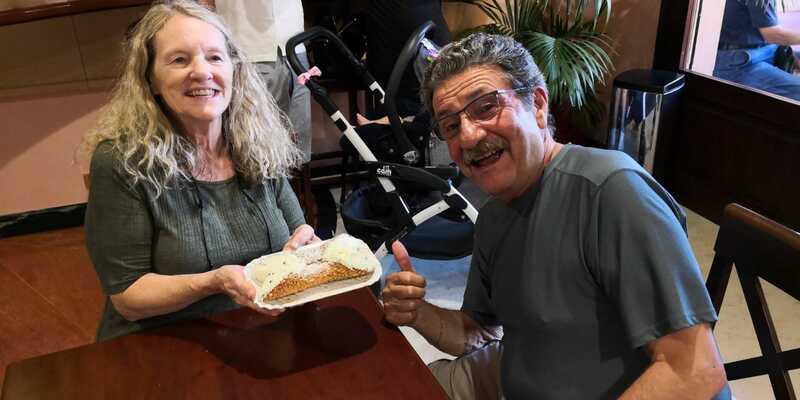 That special cannoli…what can I say. The best I have every had! 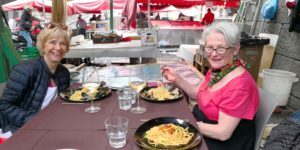 We let them choose a place for lunch in Trapani and it was delicious! Our day with Andrea to Sciara to visit the family was great he was good at doing the translations for us. He managed to find the church’s in Termini Immerse and Trabia without any trouble. We asked him to pick a place for lunch and we went to a restaurant at the bottom of the castle in Caccamo. It was so delicious. He is very personable and so much fun to talk to. He is going to be very successful in the tourist industry. 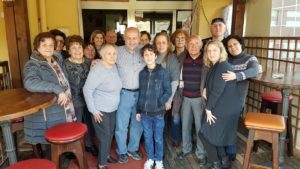 Our day with you to Cimmina was so meaningful to cousin Sal and Amy. The visit to the Museum was so interesting that we came home and purchased the movie “The Leopard” and are looking forward to seeing it. We all enjoyed the visit to Cefalu. Lunch near the water was great. The visit to your home town Ventimiglia was over the top. It is something Frank will never forget he loved the feast, the band and the singers and dancers. I will never forget the taste of those chestnuts! Thank you for showing us your family home so full of antiques! It was beautiful. Frank enjoyed talking with your cousin. The day went so fast. Cousin Amy and Sal were so impressed they kept thanking me for arranging it. I told them it was all you. They send you a big thank you! Our last day with Christina was great. She found the church in Palermo with no problem. Amy and Frank got to see the church of their great great great grandparents. She took us for street food that Amy wanted to taste and we had a nice lunch very near the church. We felt a little bad for her she was trying so hard to accommodate Amy and Sal.but Sal was having a bad day due to his Altzeimers disease and did not want to walk. We told Christina to take him back to the hotel. I know she felt bad she had other places planned for us to see. We went back to the church and this time found it open so I was able to take pictures for Frank’s family genealogy book. She found the Jeweler and Frank was able to get his trinacria. He was so happy it was just what he wanted. We had such a great time and look forward to visiting again some day. 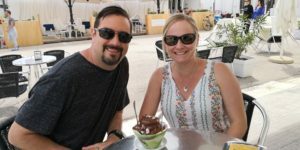 My husband and I visited Ventimiglia Di Sicilia with friends mid August. 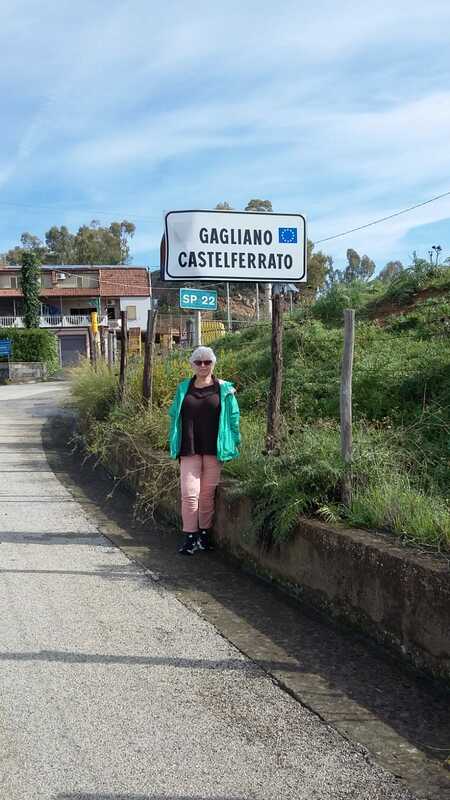 It is a small mountain village outside Palermo where my husband’s family originated from. 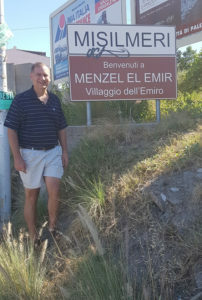 Working along with Ciro Grillo and Giovanni Montanti we were able to learn about the Abinanti family in the village and locations where they lived and died. Ciro individualized our tour of the village to highlight family history and although it was a Saturday he arranged for us to visit the local museaum and have a delicious lunch at a restaurant that opened only for us. We even got to view a local wedding procession to the village church. I would definately recommend both individuals if researching ancestors in Sicily or paying a visit to the area. My friend and I felt comfortable from the moment Ciro picked us up at the airport till the morning we were dropped off 11 days later to return to the USA. 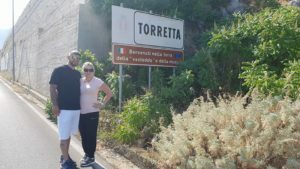 Ciro was extremely knowledgeable about Sicily and we were able to see so much more because we had him. We had the trip of a lifetime and will always remember the good time because of him. To experience the best of Sicily, one needs a guide and a driver. We had the best in Ciro. 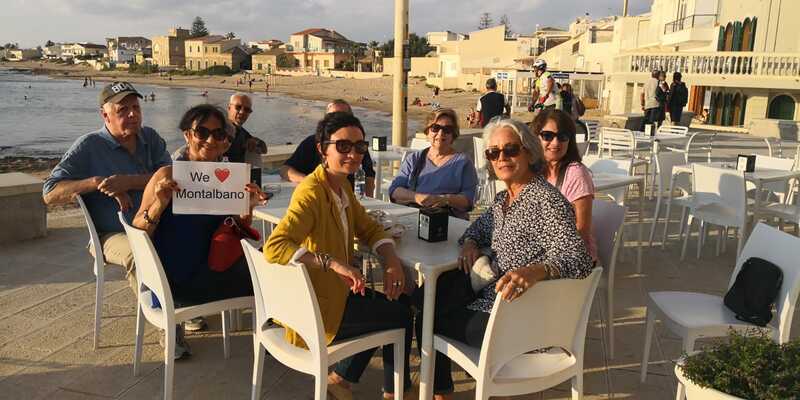 For 10 days, we ate well, learned about Sicily, saw amazing sites, felt safe and assured, with an itinerary that was well planned and memorable. Thank you Ciro. I didn’t think Sicily could get any better, but today was absolutely amazing! Great food, wine, and scenery. The best was a medieval town called Erice that had the most spectacular views. 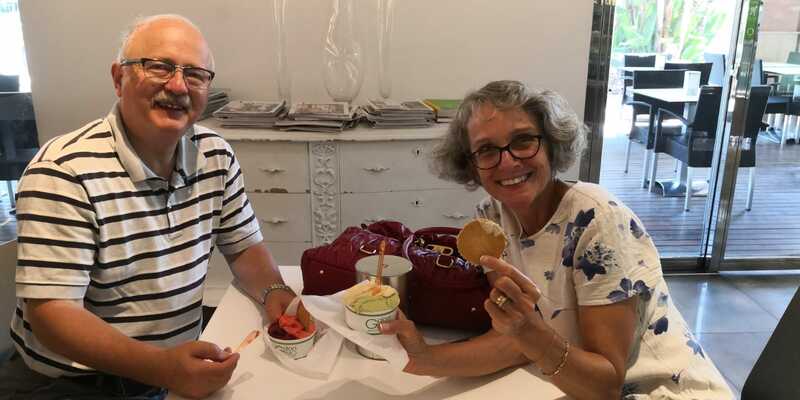 Thanks to our guide Ciro Grillo and to Margie Raimondo for connecting us. Everyone should visit Sicily! 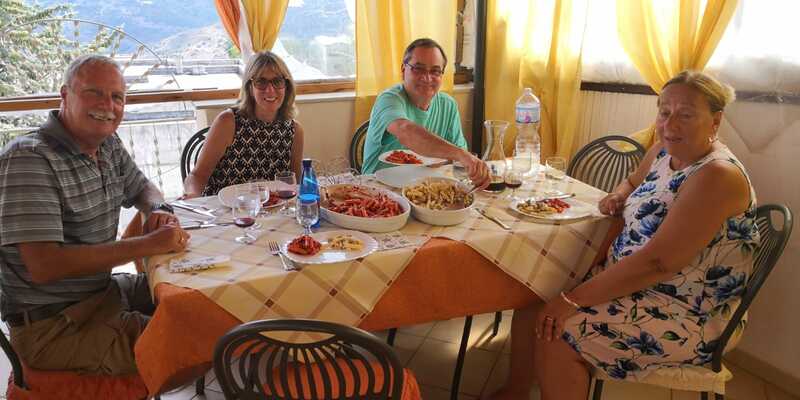 When we finally made the decision to go to Sicily on a tour organized here in New York, we had to figure out how to take a side trip to the town where our family was from. 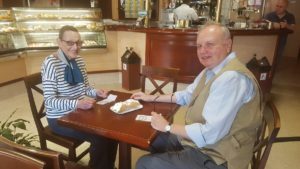 Thru our genealogist Giovanni Montani, we were put in touch with Ciro Grillo of sicilyroutes.com. 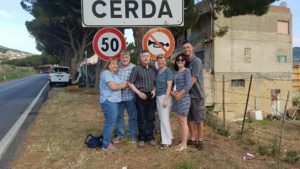 We were met by Ciro at our hotel in Palermo and he drove us to the town of Resuttano, located in the center of the island. Thru research completed by Giovanni, Ciro was able to show us the two streets where our family lived, and later drove us up to the local cemetery for a quick walk around. Ciro is very knowledgeable, a great conversationalist, a safe driver and he made us feel right at home on our day tour. On the way back to Palermo, he took us to an amazing restaurant, Trattoria Don Giggio in Bagheria. The food was delicious and the setting was amazing. Before heading back to our hotel, Ciro suggested we take a look at the seaside town of Mondello. We are very glad we took this little side trip. What a beautiful seaside setting. If it hadn’t been ready to rain, we would have stayed longer and we know its a place we will return to. We consider ourselves very fortunate to have been connected to Ciro and have him as our driver/guide for our family trip to Resuttano. We would recommend him highly, and look forward to seeing Sicily again, with his assistance. We missed you, but Enrique (spelling??) did a great job and we had a wonderful day! Alcamo was terrific as was every other stop we made. 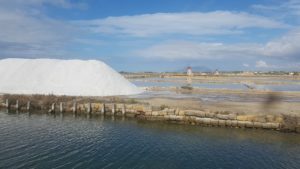 Trapani and the salt museum was absolutely fantastic! We never knew that salt could be so fascinating! Ned kept repeating for an hour or so after the tour, “I never knew salt could be so interesting!!”. We loved the girl who did that tour (the granddaughter of one of the original owners if I’m saying that correctly). She was terrific! Very informative, as were you! Erice was amazing, the drive up a bit scary, but we made it! Unfortunately, we were fogged out about 5 minutes after leaving the car, so the view was not possible for pictures of the coast, but we snapped a few on the way up. The medieval feel of the city was just incredible. The cannoli in Dattilo was the best cannoli I have ever eaten in my life and the staff there was lovely. Please tell Mario thank you again for treating us to the cannolis. That was not necessary, and we we truly appreciate his generosity. This entire trip was made so very special by you and Mario and Enrique (spelling?). It was really the trip of a lifetime for me. I appreciate all you 3 did to make it so special. Ned is the best to have made this possible for me. I will be posting some pics once we get home and I have a chance to get unpacked. If my mom sends you too many messages, please let me know….she means well and loves Il Volo very much, some times she doesn’t realize she may send too many messages. Oh…and how could I have forgotten to mention Segesta? Another amazing area of Sicily! I could tour ruins all day long and never get bored. I will be telling everyone I know that they must put Sicily on their list of places to visit and that they must use you and Mario to get around! I am so glad to have come here and so glad to have seen all that we did and have learned so much about where my family is from. I will never forget this trip and cannot say thanks enough! Ciro is a wonderful driver and guide. He knows and loves Sicily, which is quite beautiful. Our hotels and the food were excellent. You definitely want Ciro doing the driving in Palermo!!! 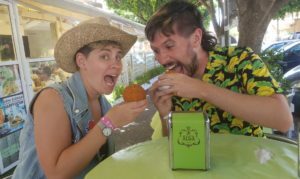 And Ciro knows the absolute best place in Palermo for gelato!!! I warmly recommend Ciro for your vacation in Sicily. He is very accommodating to your needs. 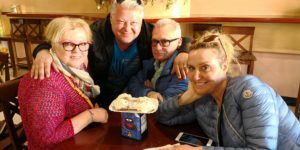 Ciro and his team gave us a marvelous 10 day trip to Sicily in the Fall of 2017. He planned and executed it brilliantly; everything–hotels, food, sightseeing– went off beautifully. We look forward to returning with him. Everything went very well. Guides were great! Thanks! Just wanted to tell you that Marco did an excellent job. Thank you Ciro Grillo, aka “Mr Sicily”. You overwhelmed my sister & I again with your knowledge & scenic tours of this magical land you call home. Erica and I are used to planning things on our own when we go somewhere new, but a family member recommended Ciro to us and told us he would show us things we’d never be able to find on our own. 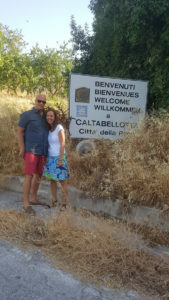 Even though we only had 5 days in Sicily, Ciro brought us to so many wonderful and beautiful places! 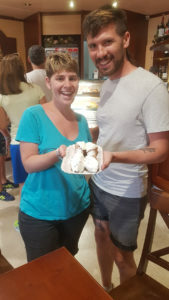 We had the best cannolo in Sicily at a small shop in a small town, we saw Taormina from the even higher mountain town of Castelmola, and most amazingly, we were able to get in touch with, and meet, relatives of mine in Sciacca! 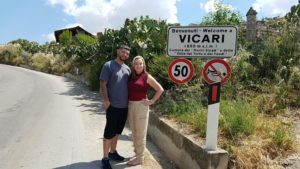 Ciro really loves Sicily and knows so much the history of the island and things to see and do, and it’s very apparent when traveling with him. It was so worth it to tour with him, and we really hope to be able to do it again someday. Special thanks to Ciro Grillo and Rosario for a fabulous tour of Sicily. Also to Michaelangelo D’Michelangelo D’Ambrisi for putting this trip together for us. Everything could not have been more perfect. Grazie mille per i tour in Sicilia. Our family had a wonderful time, it could not have been better. 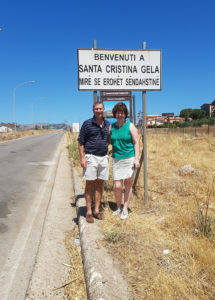 We enjoyed seeing the ancestral towns as well as Trapani, Segesta, Mondello, Monreale, Cefalu’ and the rest. My personal favorite was wandering through the Mercato il Capo in Palermo camera in hand. It was great meeting Giovanni for lunch in Trapani. And the food at Cantina Siciliana was fantastic. In fact, all the food we had was great. If you are looking for the most authentic experience of Sicily I would highly recommend Sicily Routes by Ciro Grillo. If it wasn’t for him we wouldn’t have gotten a chance to see Sicily for what it truly is. He is very knowledgeable when it comes to touring all the beautiful towns from coast to coast. You can’t ask for a better tour guide he is great with communication and translating for you especially if you are going to meet with friends and family like we did! So to say the least Thank You Ciro for everything we truly appreciate! Until we meet again Ciao! Ciro was a wonderful guide that took us to villages my husband’s family have lived in for centuries. The car for the 6 of us was comfortable and his driving was wonderful. 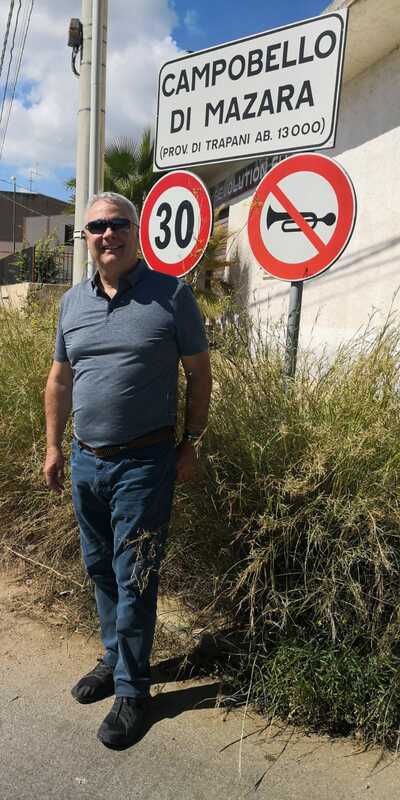 He called a woman in Licata who knew the town and she found the priest to lunlock the church where relatives were baptized and married. Then Ciro helped us when I spoke to men in the Cerda town square inquiring about people in photos I had brought along that were taken by my husband’s aunt in 1977 and discovered one woman was still alive. 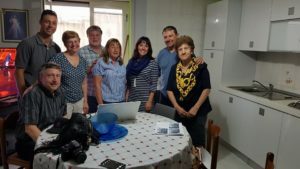 Ciro then took us to her house and translated for over an hour so we now know two more LaMonica’s and Angelina was able to put names to most of the people in the unlabeled photographs. We had a wonderful day with Ciro. We wouldn’t have those memories without him. Thank you so very much for the countless acts of kindness you showed to me and Beth while we were in Sicily. Please let me know if you would like me to add anything to the testimonial below, or if there is something that you would like me to change. My wife and I were fortunate enough to be put in touch with Ciro Grillo, a truly exceptional tour guide. 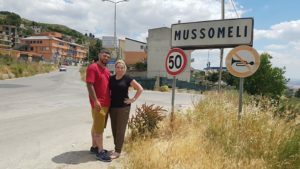 While in Sicily, Ciro took the stress out of seeing the sites we wanted to see by driving us to various locations and expertly sharing details about the history of each location. 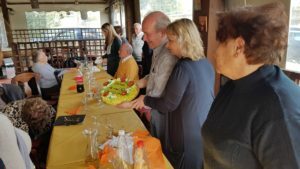 Ciro’s services were absolutely indispensable when he drove us to meet our family in Sicily and acted as our interpreter since he is fluent in English and Italian. Ciro will customize your travel based on what you request to see. Whether it is going to any location in Sicily, bringing you to the place that serves the best street food, or giving you a recommendation on a hotel or restaurant, Ciro will amaze you! I give Ciro the absolute highest recommendation since he is a wonderful tour guide, who becomes a very dear friend! —Whether in Sicily, or in the United States, Beth and I look forward to seeing you again!